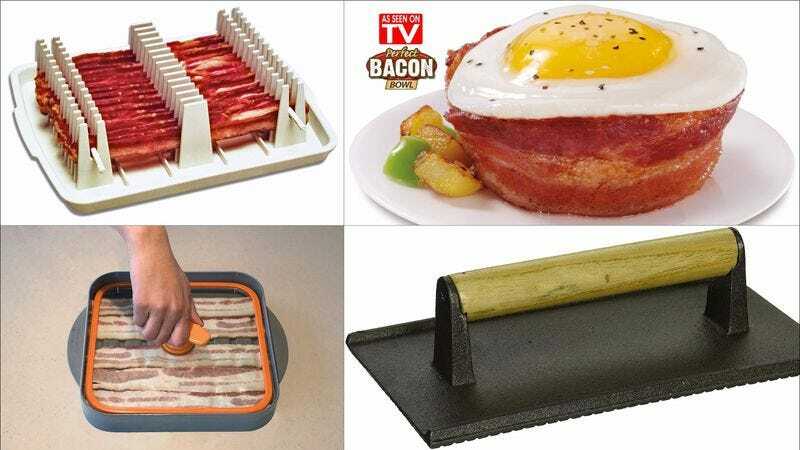 Which of these kitchen gadgets is best for makin’ bacon? Bacon’s recent revival amongst the culinary cognoscenti invigorated the taste buds of pork lovers everywhere. It also inspired any number of innovators, who sought ways to create a better strip of bacon. Some wanted to make it less greasy, others crispier, and a few pioneers even considered bacon’s shape and ways to manipulate it. Because we’re a curious (and hungry) bunch here at The A.V. Club, we figured a test was necessary to see if these products actually do prove themselves to be a worthy alternative to the age-old skillet. What is it? The Bacon Boss is a big, clunky contraption that promises cleaner, crispier bacon from the microwave. It works like this: place four to six strips of bacon on the tray, then screw down the tempered glass lid, which presses the bacon to keep it flat and squeeze out the fat as it renders. It cooks in the microwave—one minute for each strip—and the fat and grease drips into the integrated tunnels, separating it from the strips to allow for a healthier bite. Does it work? Almost too well. The bacon is pressed so tight by the glass lid that it leaves absolutely no room for fat. This tends to shrink the strips considerably, which says something since the tray itself isn’t big enough to accommodate a standard full strip. The result are brittle, ultra-crispy strips with nary a trace of fat. It works best with thick-cut strips. Should you buy it? If you like your bacon super crispy, go for it. It’s also a great tool for making your own bacon bits, as the finished strips crumble easy in your fingers. It doesn’t make the cooking process much simpler, though. As previously stated, the contraption itself is unwieldy, and the cleanup isn’t as easy as advertised. Storage might be tough, too, especially if you have a small kitchen. What is it? Like the Bacon Boss, the Bacon Wave is a microwavable product that aims to separate the bacon from its drippings, thus reducing its fat and cholesterol content. Instead of flattening the strips, however, the Bacon Wave props up the bacon using cooking rods that send grease and fat dripping to the tray below. Does it work? Yes. The resulting strips are crisp, but not as hard and brittle as those made with the Bacon Boss. Since they’re not being pressed, the bacon maintains just enough fat for those that prefer a little chew. A word of warning, however: Be sure to read the cooking instructions carefully. If you cook the contraption too long or at the wrong wattage, the plastic can begin to melt. Should you buy it? The Bacon Wave maintains the bacon’s integrity better than the Boss, and allows for more distance between the grease and the meat. The result is also a lot tastier and crispier than bacon that’s been microwaved on its own, which usually turns out rubbery. Best of all, perhaps, is that you can make up to 14 strips at a time, as opposed to the Boss’ four or six (what kind of animal only eats four pieces of bacon?!). It’s hard to look past people’s issues with the plastic, however. A new roll-out with better materials is long overdue. What is it? A clever way to create a bowl made of bacon. Basically, you wrap three strips around the included vessel, then pop it in the microwave or oven. The bacon fuses together as it cooks, resulting in a sturdy, edible bowl in which you can serve eggs, salad, or, should it strike your fancy, a scoop of ice cream. Does it work? Yes and no. In the microwave, the bacon definitely fused properly and the bowl itself was certainly functional. The bacon, however, didn’t cook through on its first run, and was inconsistent in terms of texture upon completion. The top of the bowl was crispy, while the bottom was bland and rubbery. The result is presumably better in the oven, though that process takes a half hour compared to the mere minutes of the microwave. Should you buy it? It’s definitely a neat way to up your snack game during parties or tailgates. As a bowl, it works surprisingly well. As bacon, however, it leaves something to be desired. Also, only two bowls are included in each package and, considering only one can be microwaved at a time, the creation of multiple bowls will be a time-consuming process. What is it? A simple, no-nonsense bacon press, which you can use to flatten bacon strips and render off more fat. There’s plenty of these around, but the New Star model is one of the cheapest, not to mention as functional as its pricier counterparts. Does it work? As a bacon press, absolutely. It’s also marketed as a steak weight, but its aluminum construction is far too lightweight to excel in that regard. The press is perfect for bacon, however, and its ability to flatten strips is helpful should you be frying them up for a sandwich or garnish. Should you buy it? If you like cooking bacon in a skillet the old-fashioned way, you can’t really ask for a better tool. Sometimes, the simplest stuff is the best stuff. It has a wooden handle that stays cool, as well as a versatile design that lends itself to other types of cooking. The only problem is that it’s rather large, and doesn’t entirely fit in 10-inch round skillets. You’ll be fine with a square skillet or a traditional grill, however. The A.V. Club’s coverage of all things bacon is brought to you by the makers of HORMEL® BLACK LABEL® Bacon. No products in this article are affiliated with or offered by HORMEL® Foods.